University's visual identifier has changed and evolved throughout the existence of the university. One thing has remained the same: AUA. This abbreviation is the basis for the university’s brand, taken from the people who comprise their extended community: students, faculty, staff, and Armenian society. The new official logo is grid-based and custom-designed. It is available in both Armenian and English versions in respect of the two cultures to which the institution owes its existence. The placement of the university name is available in horizontal ('River') and vertical ('Mountain') lockups. There will be cases where AUA logo will be reproduced without the “American University of Armenia” English or Armenian text. The objective of this project was not to rebrand but to define and systemize the visual identity and to create guidelines that would be appropriate and applicable. Since the very beginning of our process, we encountered inconsistency and lack of essential visual elements in AUA arsenal of visual tools. Although, we did not plan to change the logo, the need for this change became clear as we studied the visual material that AUA produced throughout its existence. 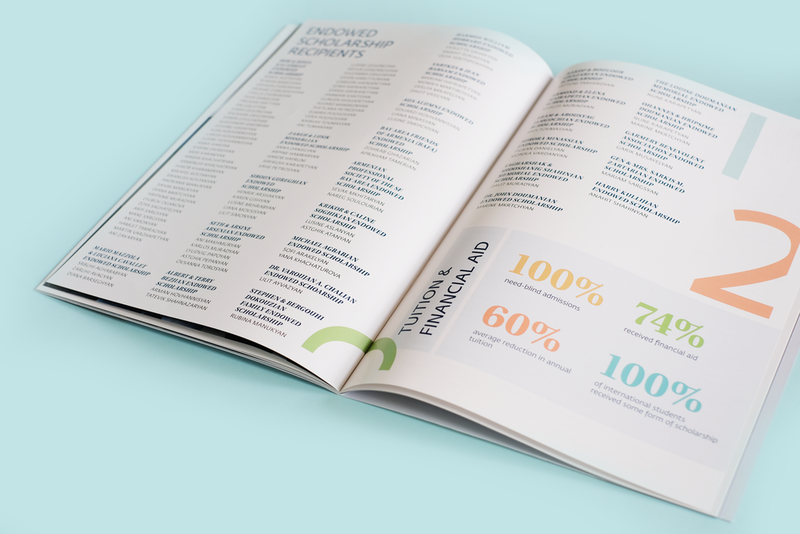 We consulted the best international practices and studied the visual systems of dozens of US universities to offer the most appropriate solution. After thorough research, a decision was made to separate the seal and the logo. The seal became the symbol for university legacy and heritage. In search for logo inspiration, we collected all media, where AUA abbreviation was used as a visual identifier. We did not select a typeface to create the logo, but built geometric mono-weight letters, based on a mountain-shaped grid. Thus the name for the primary logotype -- Mountain Lockup. AUA wordmark together with the College/Extension/Program name, when placed according to the parametres as displayed here, sum-up the Visual Identifier lockup. 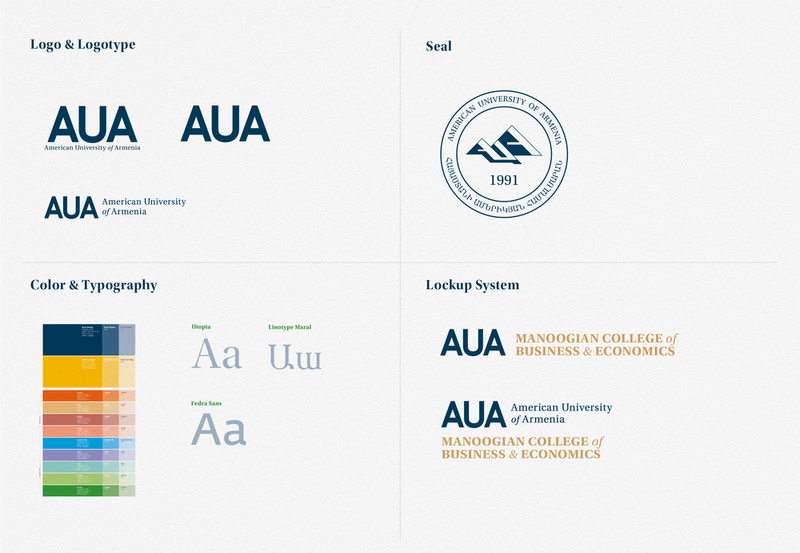 All departments and faculties at AUA should use the following system to create visual identifiers. In the case of research centers, However, there may be exceptions when research centers or affiliate programs need to develop a visual identity separate from the university. Such identities should be developed by a team of qualified professionals and with a thoughtful consideration of AUA branding, maintaining AUA positioning as the master brand. Inspired by Saryan’s art, AUA colors are warm and vivid. The names of the colors take a cue from the themes of Saryan’s paintings. Primary color palette is formed by a high contrast combination of deep navy and warm yellow with 70% and 30% tint shades. These play a role in each sub-palette, even if it’s a minimal one, and should be used by all AUA departments, colleges, schools, extensions and faculties. 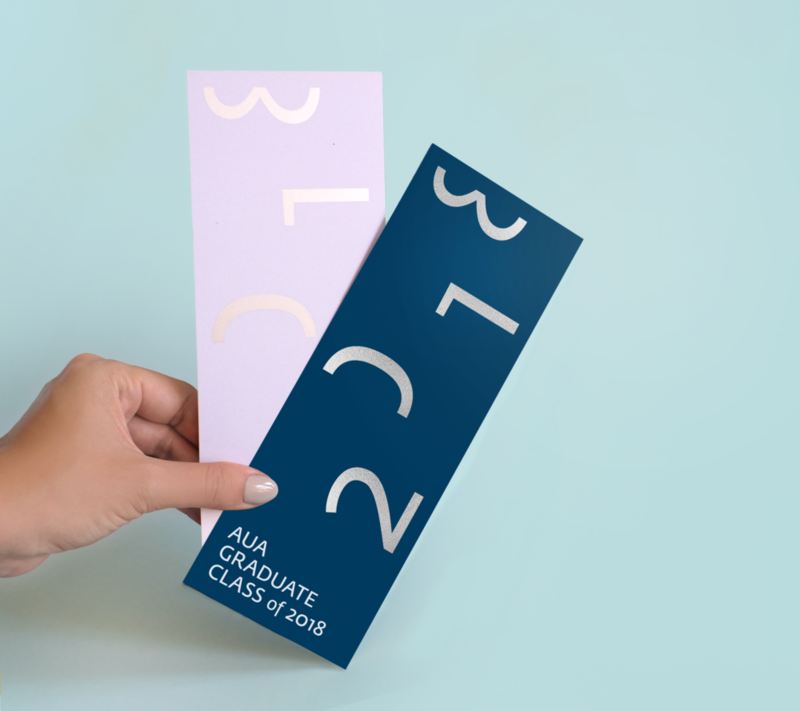 Secondary color palette is based on academic regalia color standards: each faculty program has an assigned color which should dominate in any media produced by that faculty. We defined three font families in AUA arsenal, which break down to two combinations: one for Armenian and one for English languages. Each of the typefaces has a selection of styles and weights allowing for flexibility in various communications. When applied thoughtfully, and in accordance with this guide these typefaces allow to create a complex type hierarchy - appropriate for each communication piece. Fedra Sans humanizes the communicated message and adds simple, informal elegance. The font family comes in five weights, each accompanied by italics and small capitals. This font supports Armenian as well as Latin alphabet-based languages which is crucial for AUA to maintain consistency among all of their channels. Linotype Maral is an Armenian serif typeface. Maral should be used according to same instruction as Utopia, except for it should apply to Armenian texts only. Utopia qualifies as a transitional serif typeface. With a reasonably solid design, current versions of the typeface includes features such as ligatures and small capitals. It is released in four optical variants - display, headline, regular and caption - each in regular, semibold and bold weights. 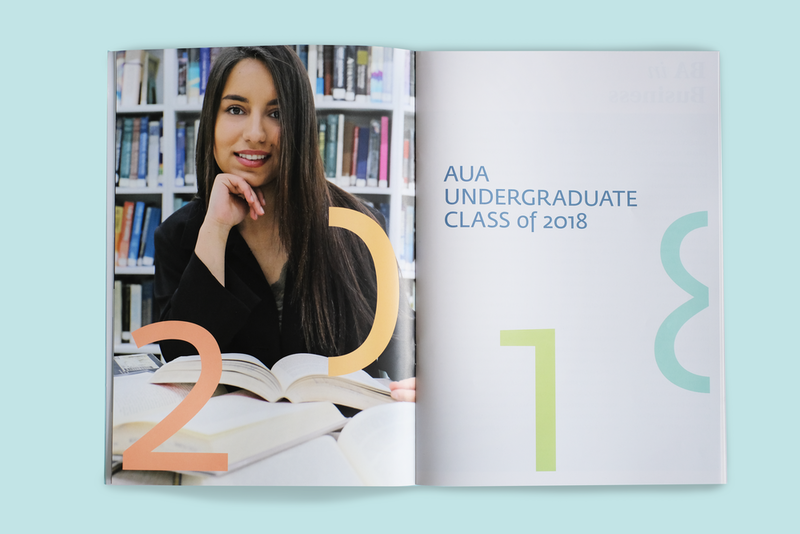 The brand refresh modernized AUA’s visual identity, introducing new colour palettes, typography and layouts styles that make AUA’s communication materials bold, vibrant and relevant in Armenia and globally. Here are some design system applications: corporate stationery and merchandise. The seal is included on formal letterhead. It will also be included as a stylistic element in business cards and in other stationery. 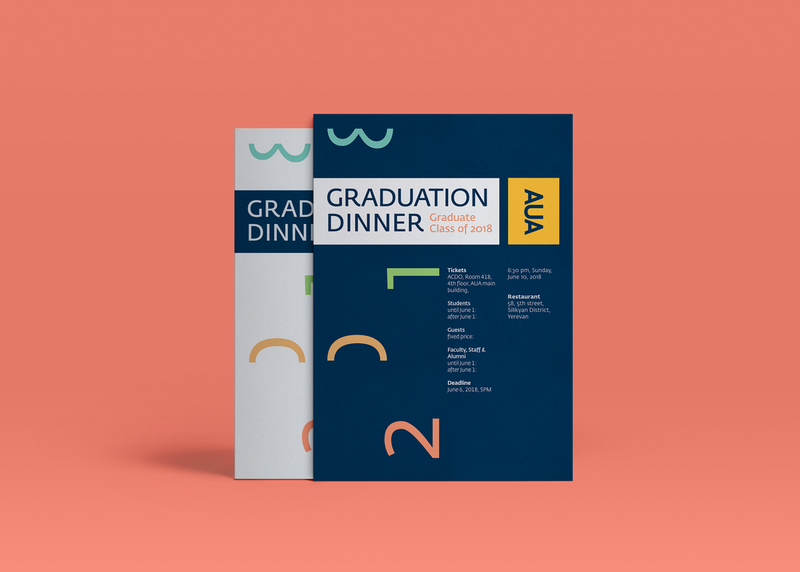 Following the visual identity reboot, modern-looking event program, invitations and promotional items were designed for the 26th commencement ceremony. The Commencement Program highlights the scale of the University’s achievements in 2018, including faculty teaching excellence prizes, research awards and student success stories. 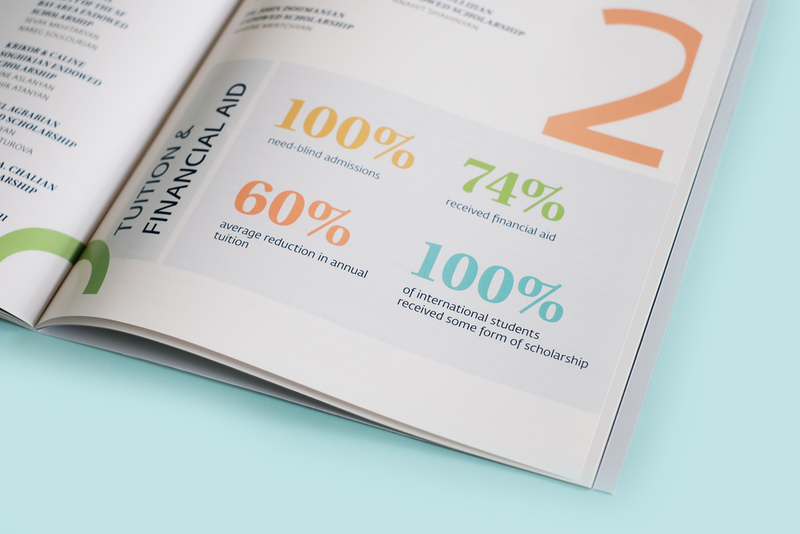 Information emphasizing student geography, tuition and financial aid, is translated into big numbers, that are engaging and accessible.